A rainbow. It was almost too sweet to be true. I looked toward the east, over the endless green canopy of the rainforest, reveling in the upper air on my face. For the first time in days I felt I could spread my arms again and not feel so closed in between the trees. Now I stood atop them, next to my brother and one of my best friends, savoring one of nature’s most beautiful displays of color, light and joy. 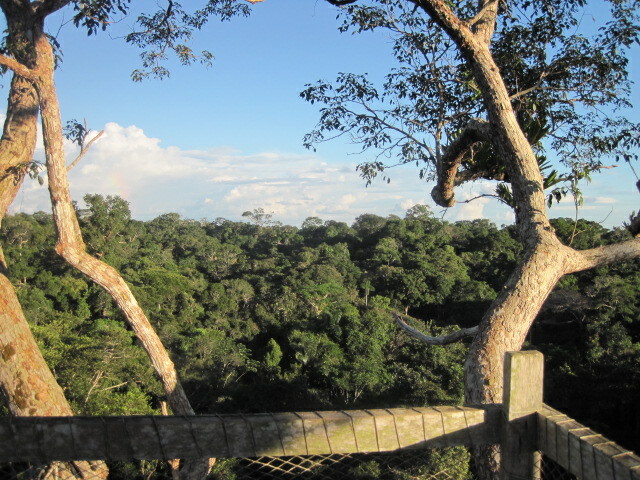 We had reached our last new Lodge, the research station at the Amazon Conservatory for Tropical Studies. After a morning of birding by boat, followed by lunch, we hiked through the jungle to the field station. ACTS is a slightly more rustic lodge, smaller than the previous two at which we had stayed, but it has one major feature that has made it the part of the trip I have most looked forward to: the canopy walkway. ACTS canopy walkway is several hundred feet of single-file planks rigged with netting and steel cable, linking the forest floor and several emergent trees high above the canopy. It was on Platform 6, the highest point of the walkway at nearly one-hundred twenty feet off the forest floor, that I now stood with Kaeo and Jack. We were at ACTS to take advantage of being in the most biodiverse ecosystem on the planet and execute the research projects we planned before our departure. Several of our projects involved variation in the levels of the rainforest, and we would spend all of the next day working on them. 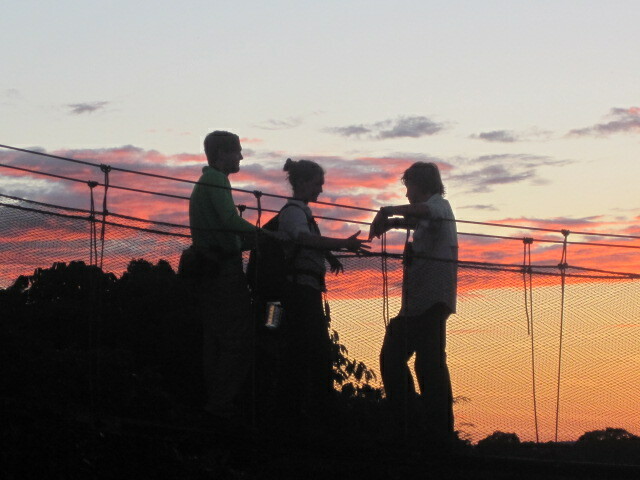 But for now, Raul and Lucio were taking us to the canopy walkway, to watch the sunset from the top of the world. We drew names out of a hat to see who would be on Platform 6, and mine, my brother’s, and Jack’s names came out. I tried to contain my excitement. I have been in or above the forest canopy thrice before–once on a similar walkway in Guatemala and twice on top of Mayan temples in the ancient city of Tikal. This one was different. I was in the rainforest, and this time I understood what that really meant. Lucio and Raul took us to the initial platform, a thatched floor on stilts about twelve feet off the ground. They invited us onto the first walkway, a narrow bridge with safety nets on either side rising to head-height. I hopped on and started walking. At first, the wobbling and slight rocking of the walkway made me nervous; I am not naturally inclined to heights unless there is a firm, preferably flat surface beneath my feet. But pretty soon I got the method down. Slowly we ascended, rising past the leaf-cloaked trees, their branches laden with the iconic epiphytes, or air plants, whose roots, depending on the species, sometimes stretch dozen of feet down. Most birdcalls only Lucio knew, but I did recognize one from my days in Guatemala. When we reached the canopy the Screaming Piha, a diminutive bird but the loudest one in the forest, threw its wolf-whistle call over the treetops, and I felt the aura of the upper rainforest settle over me like a gentle wind. We spent that sunset on the highest walkways and platforms, a blazing ball of orange sinking beneath the horizon and setting the clouds aglow. Swallow-tailed Kites wheeled on thermals to the south. There was magic up there on Platform 6, a solitude but a connection to the forest around us. I think we all felt some of it as the sun went down. On the way back, we visited the patch of forest hosting bioluminescent fungi. Raul took us a little off the trail next to a big emergent tree and asked us to shine our lights upward before turning them off. After a few seconds, we looked down. The floor was covered with glowing nodules of bioluminescence, like someone had taken stardust and shaken it amongst the roots. This place had more than one kind of magic, it seemed. The next day, the rainforest lived up to its name. Up until now there had been little precipitation, but shaggy gray clouds rolled in on Wednesday and a locally-named “female rain,” short-lived but with something to say, soaked the field station. We still went birding on the walkway at 6:00, a few of us rejecting ponchos and letting the clean water wash off some of our stink, but most projects scheduled for being out in the morning holed up until lunchtime, hoping the rain would stop. It let up some, and most of us got solid data in to work on our projects. Kaeo poured sugar water on the floor to call in his ants. The butterfly groups compounded pictures and identified several species. I, with the help of Jesse, started to work with the birdcalls, using his recorder. Jesse has been with us the whole trip, and I haven’t talked about him yet simply because there hasn’t been enough room. He works with the Rainforest Trust, a Washington D.C. based group dedicated to creating parks and preserving the rainforest, and is with our group as a teacher and occasional guide. We met up with him in Miami, when he was wearing a T-shirt with the classic “evolution of man” silhouettes leading to a man hunched over a computer, with a caption reading “Something, somewhere went terribly wrong.” I liked him instantly. He showed me how to use his handheld recorder, which I took into the treetops to capture birdcalls so I could measure the frequency at different heights. Though my research project has evolved into a more “sounds of the rainforest” endeavor, with the local stories and lore of the environment my greater focus, I still wanted birdcalls in my hand. I loved taking five-minute chunks of sound and playing it back, hearing again the parrots and the oropendolas and the pihas. I would put it into Mrs. Vooris’s computer the next day, when we would be presenting our completed presentations. 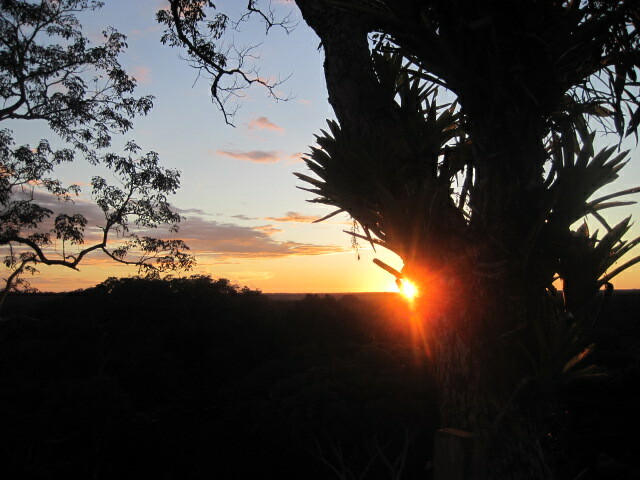 At the end of our only full day at ACTS, we went back up for a sunset on the canopy. This time though, we were quiet, curbing our excitement and adrenaline, taking it all in with reverence. The rainforest was singing under the orange light of the sun, and a fine mist started to rise from the trees, lacing the green with gossamer clouds of white. We are so lucky, I thought, to live in a world so beautiful and powerful and wild. Sometimes when I go to certain places I get a brush of the force of nature, of all the beings contained within this garden of gods, and feel a deep sense of peace and purpose. When tired from schoolwork, or later, work-work, I will remember Platform 6 and the rainbow, the majesty of the rainforest, and the wonder and importance of the world I am trying to help save. And I will remember then too that it is worth it all. Thank you for hosting these kids! I shall be a forever grateful parent! It is our great pleasure and privilege to get to work with faculty and students like those from Gunston! They are the reason we love what we do! Amazing writing! I enjoyed every minute and look forward to the next article. Just fantastic Birdie! Thank you again so much for sharing and I love , love, love the backlit picture of Jack, Kaeo and Claire! Great photo Alison! !